The simple to use and easy to read Sutherland Floating Bath Thermometer is ideal for baby bathing. 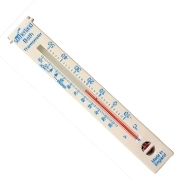 The Thermometer features clearly marked Warm to Hot zones that show the recommended bath water temperature in both Celsius and Fahrenheit. The very young and the elderly can be scalded by excessively hot water. The thermometer has large bottom water holes that allow for an accurate temperature reading and ensure water is easily drained after use. Sutherland Floating Bath Thermometers are used within the NHS and are proudly manufactured in the United Kingdom. Instructions for Use Place the Sutherland Floating Bath Thermometer into the bath water letting it float freely. Monitor the red spirit column until it stops moving. The top/end of the column indicates the temperature of the water. Ensure that this is somewhere between the Warm and Hot zones and adjust as required for comfort and safety.